BATTLELORE is a Finnish band that plays a multifaceted style of heavy metal ranging from, Power Metal, Melodic Death Metal, to Folk Metal. While I am not a fan of Folk Metal, I have been listening to it lately to broaden my horizons and I can say that the description I just gave that I acquired from their bio sheet is a perfect summation of how they sound. The sounds include growling male vocals, and clean female vocals that seem to be stemming up all over the place in the metal scene as of late. Also, Keyboards, Flutes, symphonic elements and then the basic heavy metal component we all know about consisting of guitar, bass, and drums. It never ceases to amaze me how so many elements can be combined without it sounding like a confusing mess. BATTLELORE provides many things for many people with all the different elements and the lyrics consist mostly of J.R.R. Tolkien stories. 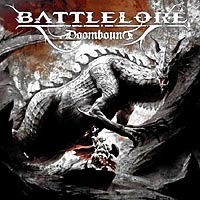 Since the lyrics are as such, it is obvious that BATTLELORE are above all, a fantasy metal band. That is my favorite type of music as long as the vocals are clean. This is where the band loses me, but others will rejoice. Many bands have celebrated the legendary author by singing songs dedicated to his masterful writing in The Lord of the Rings. One of those bands and in my opinion, the best of them all, is THERION. You do indeed hear some THERION in BATTLELORE’s music, but that ought to be considered a good thing. While there is nothing on this release as good as “To Mega Therion”, it is only one album and I know all of THERION’s albums, so I don’t know if they have ever done anything as incredible as that song. Middle Earth is highly sacred material, and BATTLELORE does it justice. I only wish more bands with clean vocals would cover material from Tolkien. BLIND GAURDIAN has, and I find Hansi Kürsch to be far more tolerable than many of the other bands that sing on these topics. There truly is some great symphonic music on this disc, and it is used best when accompanied by the vocals of Kasia Jouhki. Her voice is both beautiful and haunting almost as if sang in a dream. She is the highlight of this album. The best example of this is on title track, “Doombound”. It begins with a heavy introduction; then at the five minute mark it contains a majestic piano interlude, and slowly builds to heavy power chord usage similar to the beginning as a fade out. That said, my favorite song on the album is “Enchanted”. Overall this is a good album for those who enjoy the multiple genres I listed as being present. The music is indeed “epic” as it is described on their bio sheet. The album ends with music good enough to be featured on the upcoming HOBBIT movie being directed by Peter Jackson, the man who filmed the Lord of the Rings trilogy. Take a visit to their myspace page and hear for yourself.